Today we are over-stimulated, over-worked and deeply stressed. By stepping onto a yoga mat, at any age, you can begin to explore the nuances of your physical body, which in turn can open your heart and mind. Lisa didn't discover until she was in her late thirties, a time when she was looking for more flexibility and relief from low back pain, due to scoliosis. The challenging yet therapeutic practice alleviated the pain, but it was the link between movement and breath that brought her back to her mat again and again. Practice became more of a moving meditation; one where she learned that contentment is always available by focusing on the present and really learning to breathe. As a teacher, Lisa loves showing her students how practicing yoga can lead them to discover ways to relieve stress, reduce or eliminate pain and find freedom of movement. Her classes are designed to give you a well rounded practice with precise alignment cues in a place where irrespective of age, ability and experience you can find your own way. 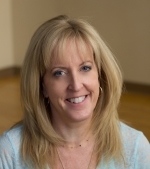 Lisa teaches a variety of classes from flow to Yin and Yoga Tune Up®. She received her 200 hour certification through YogaWorks studying under Natasha Rizopoulos and is also a Level 1 Certified for Yoga Tune Up®. She continues to study with Jill Miller, Rod Stryker, and Sarah Powers as well as a wide variety of teachers in the Boston area, and is grateful for every opportunity. Writing is another passion of Lisa's and she is currently writing her first mystery novel featuring the Yogi Detective. Writing is very much like yoga. It's a practice. In order to get better, you have to keep at it even through the difficult times. As a member of Sisters in Crime, she has found a writing community as fabulous and supportive as the yoga community. Yogi, writer, traveller, photographer, student. By blending her passions together, Lisa truly tries to embrace life with a loving heart. Sometimes you need that personal touch to ensure that you are gently guided in the right direction for your particular needs. Classes are designed to accommodate various levels of proficiency. Working one on one, however, allows you to work toward goals that suit your own body and temperament, maximizing your personal growth. Please feel free to contact me with questions or a request for a private session.